Red, White, and Blue, oh yeah, Khatu!! <--- my silly attempt at rhyming. :) Love it, K.. but then again, I love everything you wear. Happy Weekending! What a gorgeous color. Red looks great on you. Totally fab outfit. I'm always amazed at how glam and natural your makeup looks at the same time. You have blessed skin! super cute! I love your jacket! 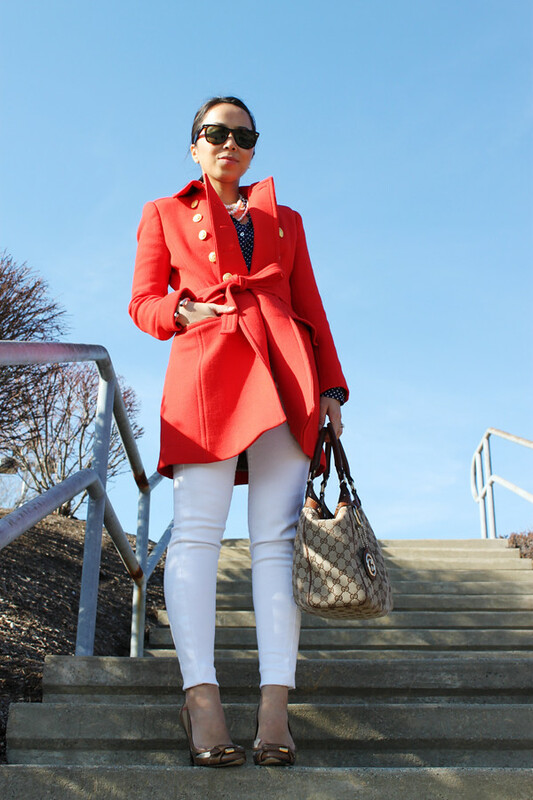 Love the red coat with white jeans, I did a similar look on my blog. That coat is just my favorite. And I love that top! 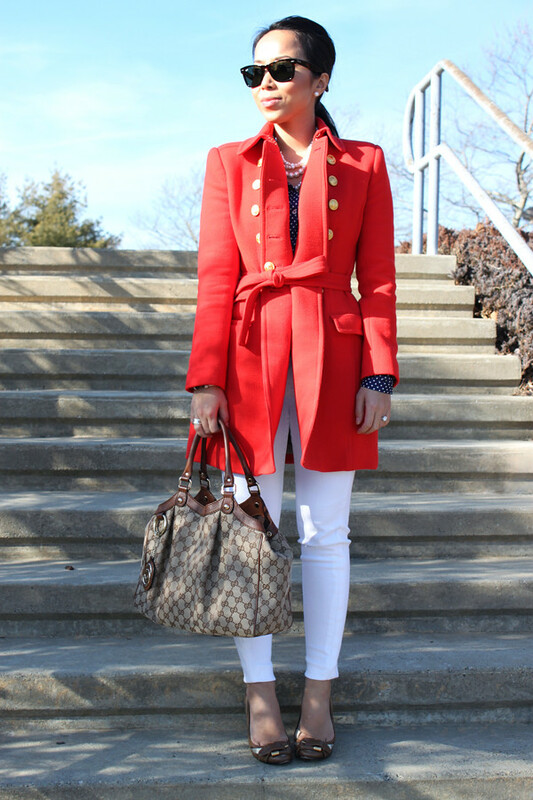 I absolutely LOVE that red coat! J.Crew makes the best outerwear! nothing beats red with navy-n-white polka dots. NOTHING. well, fine, maybe mint-choc-chip ice cream after a particularly trying day. but your color combo here is a suuper close second (and i don't take comparisons to my beloved midnight snack lightly). you look fabulous. Red, white and blue. These colors don't run! :) Great 3 pieces to put together. The jacket definitely is the cherry on top. Thanks for sharing! ahhhh i LOVE your blouse, and white pants and fun coat!! White pants in the winter?! Who would've ever thought! i am not a fan of red but wow this jacket is perfect shade and you look so good! LOVE this look!! That jacket is absolutely FABULOUS!!! And loving the polka dot blue and white! !